K and I just discovered the nice fish our Whole Foods has to offer. I wanted to have some sort of fish dish since it is Lent and that means Fish Fridays for this Catholic girl! I am sharing this not on a Friday, but it allows you time to pick up some fish for this Friday, if you wish to have some fish fun. 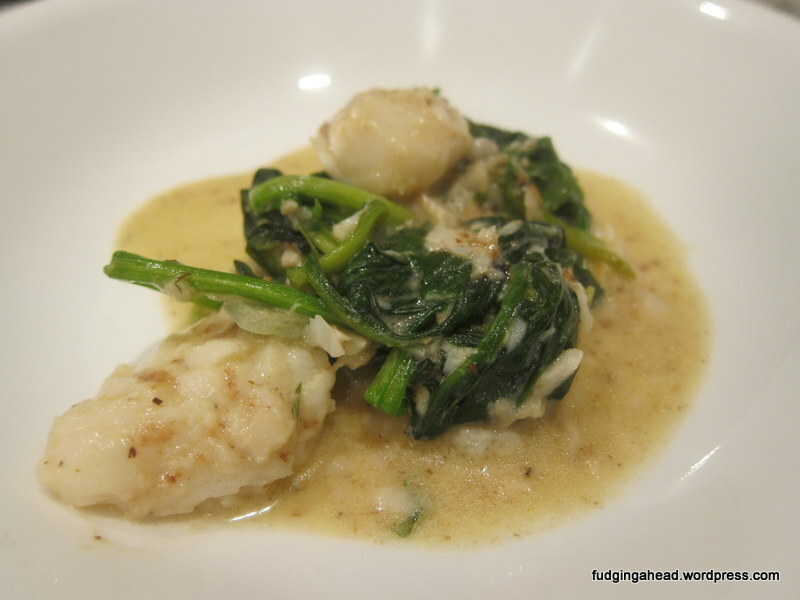 We previously have made a version of this dish with shrimp and I felt that fish would work well, too. 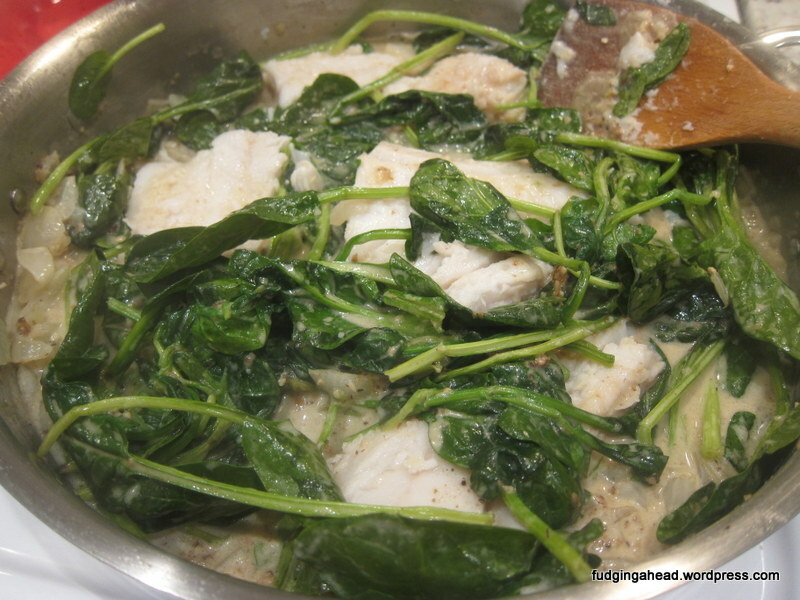 You can really use any quick-cooking fish that is easy to saute in a skillet. If you decide to use shrimp, add it at the end and do not partially cook it at the beginning like I do with the fish. This dish does not need to be spicy, but feel free to go nuts with your choice of spicy seasoning if you love it. 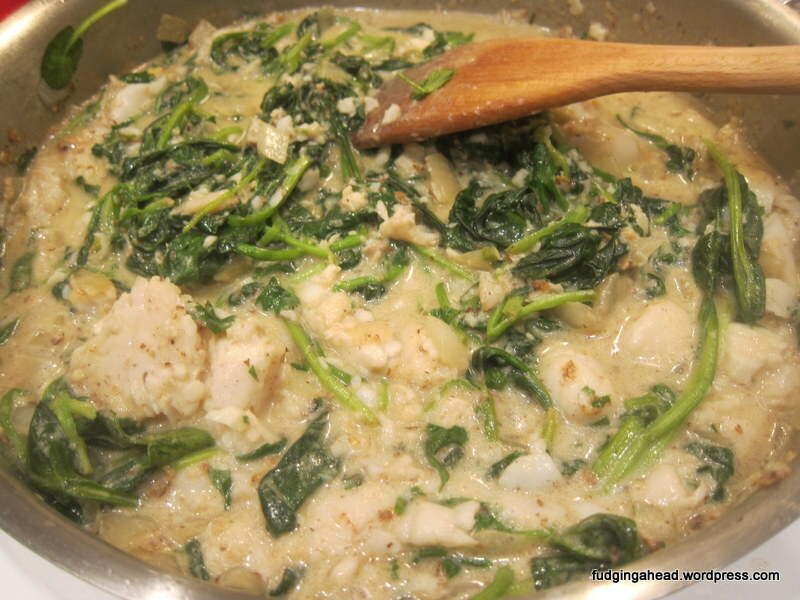 Likewise, you can substitute a different quick-cooking green for the spinach (think Swiss Chard, lettuce, etc.). Don’t leave out the cilantro, though. 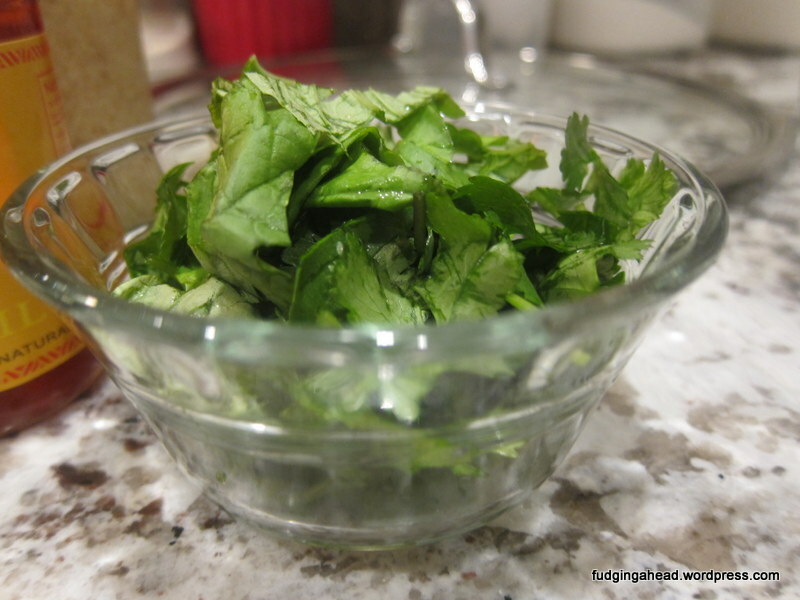 We are huge fans of cilantro in this house! I am not sure what fish we used for this. I picked it out at the store with K because it was on special, and it starts with a T…and I think there is a “u” somewhere in it? If you know, feel free to share! We forgot promptly, read the label before I cooked it, then forgot again. Of course the trash is long gone, so the name is gone with it. Usually my memory is better than that. Oh well. It was some pretty awesome fish, though. 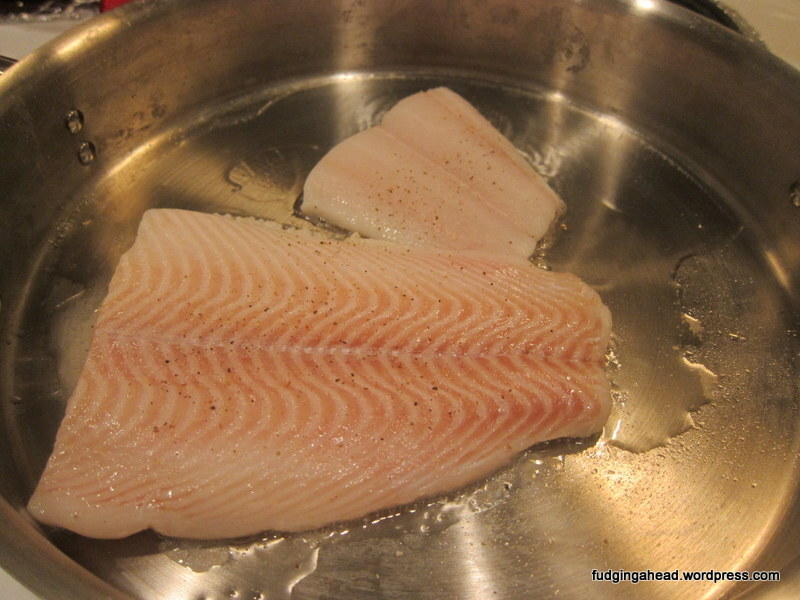 Start by patting the fish dry and sprinkling the fillets with salt and pepper. Heat some butter or oil in a large skillet (the amount depends on how oily your fish is). Brown the fish on each side, but do not cook it through. Set aside. 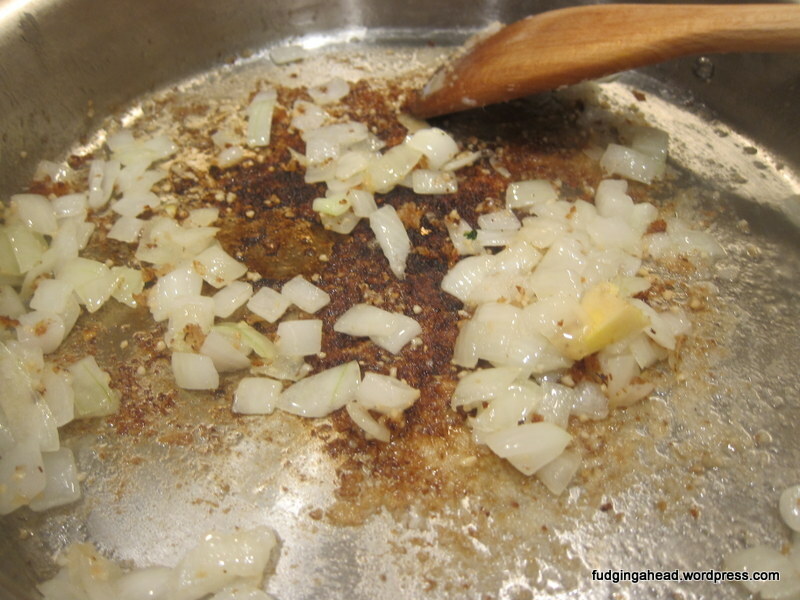 Add more oil or butter if necessary, then sauté the onion until it is softened and slightly browned. Stir in the ginger and garlic, sautéing for about 30 seconds to a minute. 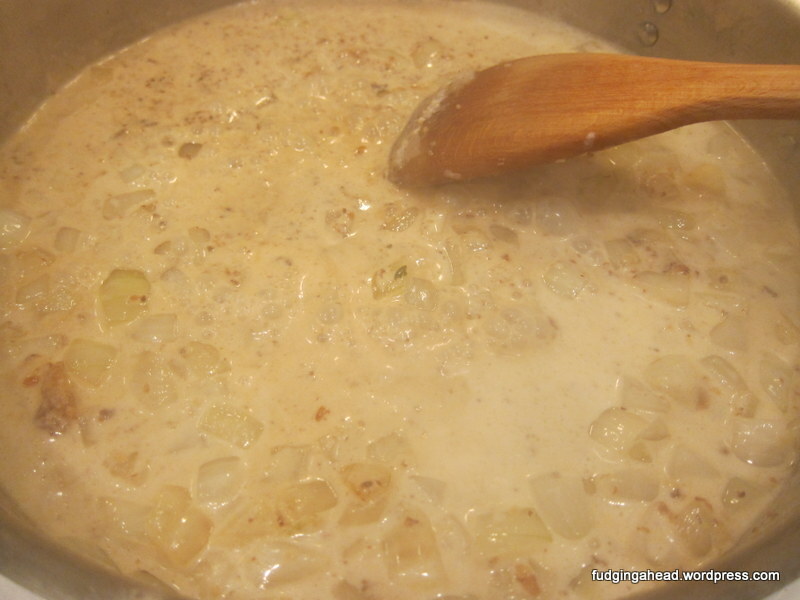 You can add some lemon juice to help get up some of the brown stuff if you like. It just adds flavor. Stir in the coconut milk and enough chili oil for your palate. Add half of the cilantro then stir in the spinach. Nestle the fish fillets into the sauce and allow to lightly simmer until the fish is cooked through. Stir in the remaining cilantro, cooking for another minute then remove from the heat. 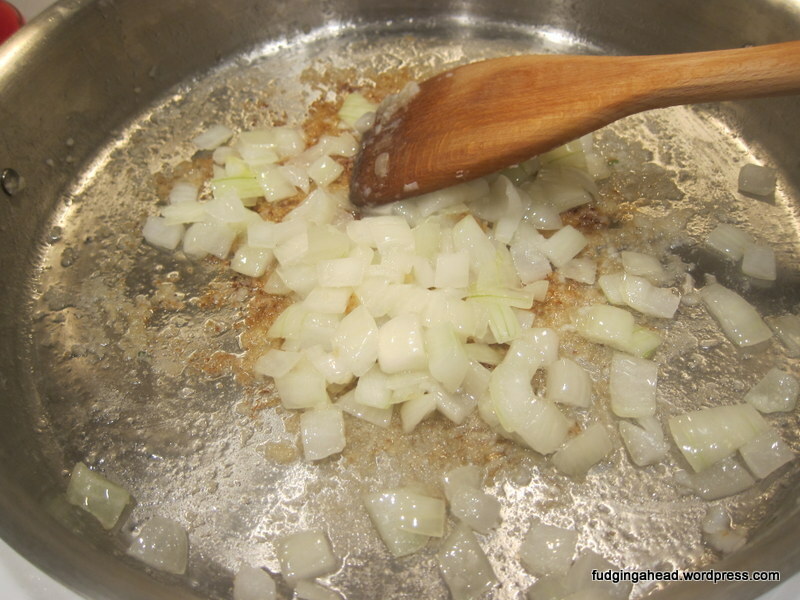 Add more oil or butter if necessary, then sauté the onion until it is softened and slightly browned. Stir in the ginger and garlic, sautéing for about 30 seconds to a minute. Stir in the coconut milk and enough chili oil for your palate. Add half of the cilantro then stir in the spinach. 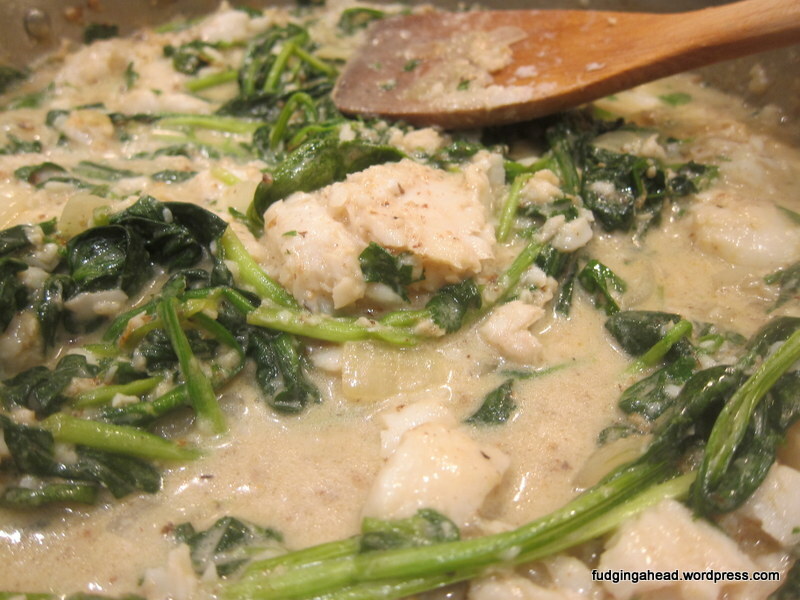 Nestle the fish fillets into the sauce and allow to lightly simmer until the fish is cooked through. Stir in the remaining cilantro, cooking for another minute then remove from the heat. Yum! This looks really good! This looks like such a great recipe! I got a fish cookbook a few years back and one of my favorite dishes is a green bean coconut milk fish recipe. Okay, now I am REALLY hungry. Get some more food in you!!! Hehe. I’ve never seen just a fish cookbook. That’s great! I always look for new fish dishes since it’s so good for you.